It takes bravery to post photos of your kid’s lunch box. Okay, not rescuing-someone-from-a-burning-building bravery, but it still takes guts. Because you’re inviting people to share their opinions on some personal decisions you’ve made. And oh, do people love to share their opinions! They ask you if it’s organic. They call you a good mom. Or a bad mom. They deem your choices smart. Or toxic. 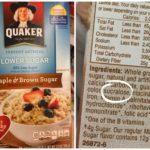 I’m lucky that the community on my Real Mom Nutrition Facebook page is kind and supportive–but I’ve gotten some flak in the past and seen other bloggers get far worse. Yet there’s a recurring comment I get when I post pictures of my kids’ lunch boxes, like the ones in the photos above: At least one person says that it doesn’t look like much food and that their child would still be hungry. I always welcome different opinions, but it strikes me as strange that people would question whether someone else gives their kids enough food. As parents, we know our children pretty well, right? 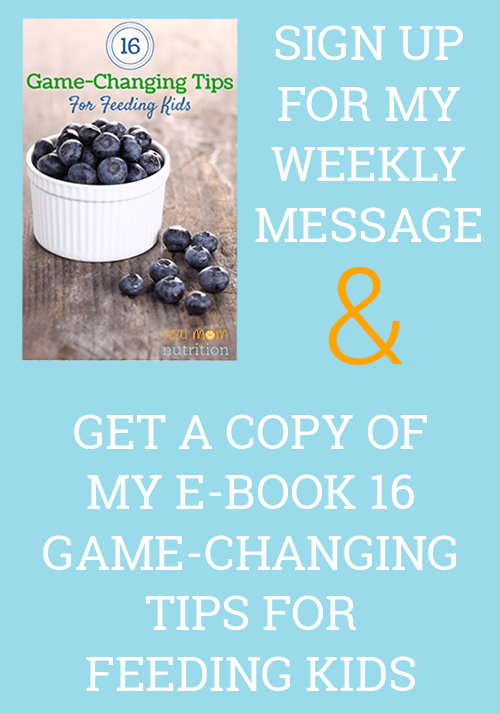 And if you regularly read my blog, you know that I have a very reasonable and unrestrictive philosophy when it comes to feeding my kids. 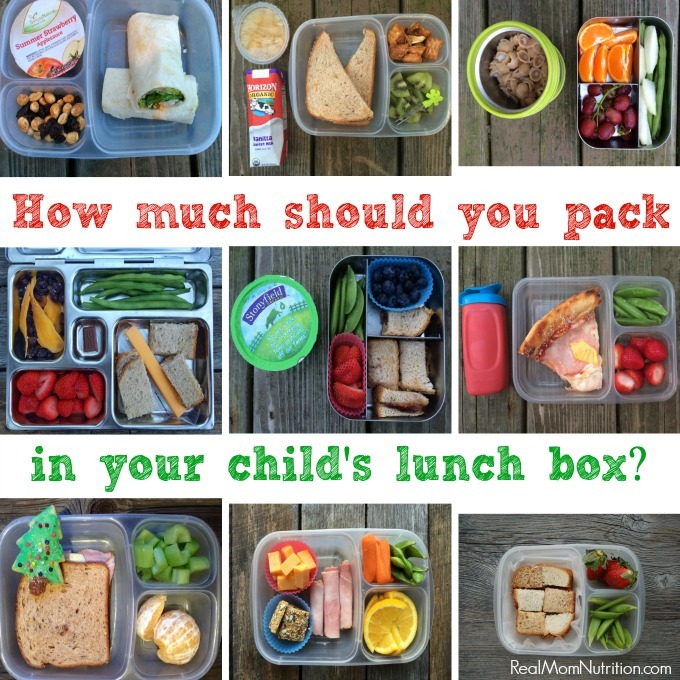 Still, it brings up a great question: How much food SHOULD you pack in your child’s lunch box? That’s obviously going to be different for everyone, since each child is unique–and appetites can vary widely from day to day and year to year. I post lunch box photos to provide ideas, not prescribe portion sizes. It’s true that my kids aren’t very big eaters. Both eat a pretty varied diet, and I’d never label either of them as “picky”. But having had many of their friends pass through my kitchen, I know there are children whose appetites are much larger. Neither of my boys has hit a big growth spurt yet, so I know heftier appetites are on the horizon. You might also like: Free Printable: Teach Your Kids to Pack Their Own Lunch! But here is something important that I’ve learned: The less I pack, the more they eat. I don’t have any science to back this up. But in my eight years of packing lunches, I’ve found that it works. 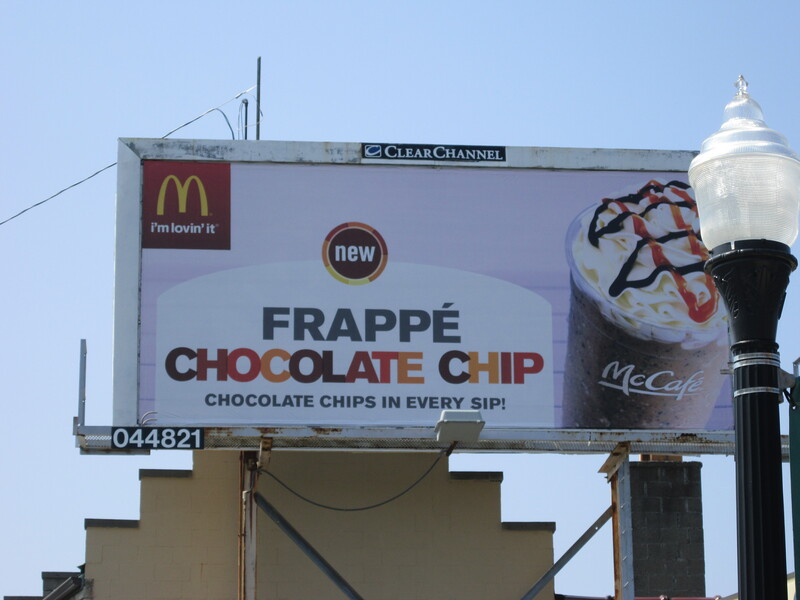 I’m sure it has something to do with a large volume of food seeming overwhelming and unappetizing. It also makes sense that if I pack a big portion of a food they really prefer (like crackers) they may devour it at the expense of touching, say, the carrots. So I pack smaller, more doable lunch box portion sizes of everything–which usually means almost everything is eaten. Yes, my older son will still come back with some uneaten veggies. And there are days when a lot of lunch comes home for one reason or another, but for the most part this strategy has worked wonders. Most importantly, I check in with them about the portions. If I pack lunch for them, I almost always ask, “Does this look like too much food, not enough, or just right?” If they pack lunch for themselves, I generally leave them alone. But if they bring home a lot of uneaten food, we might talk about why and what to do differently tomorrow. Food waste is something I try hard to avoid and something I want to teach my kids to avoid too. Want more information on the lunch boxes in the photos above? Check out this post for the details: My Favorite Lunch Boxes For Kids. What’s YOUR strategy for figuring out the best lunch box portion sizes for your kids? Have you tried this less-is-more strategy for packing lunches? This is something I think about a lot relating to the lunch I send to daycare with my 1.5 year old daughter, but I think I have the opposite problem. She eats almost everything I send, but if I send too much then she’s not hungry for dinner. It’s a constant balance! Diana–yes, it can be a tricky balance and it can take some time to figure out. We sometimes have a similar problem with my middle schooler who wants a snack that’s more like a meal (like soup or a sandwich) but then he’s not very hungry for dinner later. You’re absolutely right! I believe in smaller portions and a wider variety. I pack about 4 to 5 different foods and snacks and so far lunch boxes have come back empty! I also believe that if kids get to have a say in what they’re having (from pre-chosen options of course! ), they’re more likely to eat it. Yes to kids choosing their own options! My kids have started to pack their own lunches (I still occasionally pack for them) and I like to see what and how much they pack. It’s good lesson for them in figuring that out and avoiding food waste too. I remember when you wrote about how packing less food overall in the lunch (but still a variety of options) seems to lead to them eating more. Since then I have tried the approach of packing more food or less food, and I have to say after many months, I too notice that there is less food waste and that my daughter is eating more! Now that I know that it has made it easier to focus on the variety and balance of what I pack and worry less about the overall volume. It helps that I printed off your Lunch Box idea list and taped it to the inside of our pantry – now my daughter looks it over for ideas too! Thank you! I think you’re on the right track. Of course, kids vary, and many have much bigger appetites than I did, but my personal recollections of my bag lunches at school was that I found getting through them daunting. We were given what was (for me anyway) not enough time to eat before we had to go outside, and back in those unenlightened days, many of the teachers would force you to eat everything you’d been sent. Which put a slow-eating kid like me in a bind; school lunchtime was so stressful, trying to force myself to eat more and faster than I felt able to, so I wouldn’t get in trouble for wasting food. I agree! I mentioned that I ended up spending some time volunteering last year because our district was underfunded for lunch aides. Lunch time at schools is super chaotic, especially considering how underfunded schools are. Kids are easily distracted and have energy to burn. So eating is often second-hand to whatever is going on around them. We would constantly walk around and re-direct them to their lunches. We are unique among our friends. We don’t structure our eating based on “Breakfast lunch and dinner”. It’s based more on “are you hungry? Then eat something”. I myself eat 5-6 smaller meals throughout the day, each coming in at about 200-350 calories. So, for us, we do breakfast, making sure they get something in their tummies especially since they eat at different times. For example, my 9 year old starts school at 8am, and doesn’t eat lunch until 12 (school gets out at 3p). My 6 year old eats lunch at 10:45, then has a snack in the afternoon. I pack very small portions. Small amounts of various things most of the time. Sometimes my 6 year old will get only a handful of grape tomatoes, a few pecan halves, and some fruit. If I pack much more than that, it comes back uneaten. My 9 year old is similar, if I over pack, it comes back. On the other hand, my 11 year old daughter has always been a good eater with a strong appetite and she’s much less likely to get distracted by chatting at lunch, so as long as I pack foods she likes, she’ll eat it all daily. Every child is different, and every family is different. We sit together to eat a meal several times a week, but it’s not usually when most people would consider “dinner time”. I was raised in a household where A) we were “on diets” most of the time and B) You HAD to clear your plate, whether you were hungry or not. Guess how many of us have food issues now. All of us. I wasn’t taught to listen to my body for hunger cues. My husband’s family was the same. Always on Weight Watchers, forced to clear his plate. 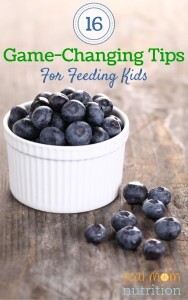 My husband and I both now choose to eat smaller meals throughout the day and our kids do the same. We get lots of lectures when we visit other families or have family over. But just because it’s not the way you do it, doesn’t mean it’s wrong. We combine that with never speaking negatively about weight and body looks and also focusing on exercise rather than eating too much. I volunteered last year at lunch as an aide for 2-3 days a week because our district was under funded for aides at the time. I couldn’t believe the amount of food that was tossed. Full juices, whole fruits (and we didn’t at that time have any policy regarding setting unopened/uneaten things aside for other students who might be hungry), barely touched sandwiches (and don’t get me started on the bought lunches wasted). I think that really allowed me to fine tune the amounts of food packed to maximize nutrition and minimize waste. I would encourage most parents to spend a few days volunteering in their cafeterias to witness how chaotic lunch time periods can be, and also to see just how little time the kids get to eat in the first place. My son told me, “please don’t pack that much food in my lunch box again.” I usually use a portion-controlled box like Yumbox, but the other day it wasn’t clean and I just packed a variety of food in plastic baggies. Oops! He was totally overwhelmed! What is the brand of the box that you use for these lunches? 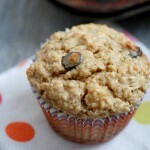 I love your blog and recipes and have found it a great resource! The lunches look delicious. My daughter (who eats lots of breakfast and lunch but not a lot of dinner) will be starting kindergarten in the fall. They don’t do recess and lunch here but rather two breaks, one around 10:30 and one around 1:30. Wondering how you suggest I pack for this instead of our normal one lunch and two snack days. Thanks! I like the idea of using the “less is more” approach. My problem is my 5 and a half y/o eats almost nothing. Refuses fruit, veggies, sandwiches, lunch meat. I am lost as what to pack! I can get him to eat a kid protein bar and sometimes a juice box. The rest is prepackaged processed choices I’d rather he not have. But I want him to eat something. Suggestions would be welcomed! !